Wohoo. 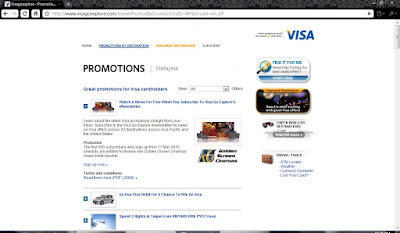 I just won myself a FREE GSC Movie Ticket Voucher from Visa Go. All I did was just by sending in my name and email and that is it. I thought I am sure enough not going to have a chance in winning it but hey what I have to lose. I don't have to buy or pay for anything to join the promotion. So might as well just try it. So today I receive a winning notification from Visa. At first I thought it was some sort of spam or something. You know. How could I possibly won right? So I head back to the Visa Go Explore website to have it check and confirm on it again and yeah, I did won. Yippie. Now waiting for the voucher to arrive to my house. Movie anyone? Thank you Visa. Now can you pwetty please let me win the Alza?